Annes Luxury Suite is situated in a serene and peaceful locale. Its management and staff are well experienced in rendering hospitality services at friendly rates. The facilities are what guests would expect of a modern hotel. Guests can locate it at 243B, Muri Okunola Street, Victoria Island, Lagos. The rooms offered are spacious and designed with beautiful architectural art. Each room features an air cooling system, a wardrobe, sofas, a refrigerator, a TV with satellite connection, a study desk and an en suite bathroom. The rooms differ in size and amenities offered and therefore come in Deluxe, Super Deluxe, Executive Deluxe and Diplomatic Deluxe Categories. Annes Luxury Suite operates a key card system. Depending on the room category, Annes Luxury Suite offers complimentary breakfast to guests. On request, the restaurant serves tantalizing meals designed to leave guests wanting for more. The bar is stocked with exotic drinks that guests can order when needed. Guests can also mingle and chill at the lounge while having their drink. Souvenirs and necessities can be bought at the gift shop. 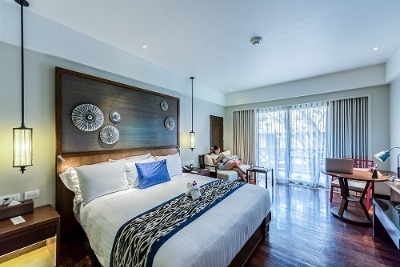 Guests can stay connected to the internet by making use of the free WiFi access provided by Annes Luxury Suite. Luggage storage, taxi pickup and laundry services are rendered at a fee. The hotel has an electric fence designed to keep burglars out. Q: Does Annes Luxury Suite have a car hire service? A: On request, car hire services are provided at a fee. Q: Does Annes Luxury Suite offer complimentary breakfast? A: Complimentary breakfast is offered to guests. Q: Is there a gym at Annes Luxury Suite? A: Annes Luxury Suite does not have a gym facility. Q: Does Annes Luxury Suite offer room service? A: 24 hours room service is rendered on request. Q: Does Annes Luxury Suite have cribs? A: Cribs are not provided. Annes Luxury Suite is a budget hotel in Victoria Island, Lagos. My stay in Annes luxury suites was very delightful and comfortable. Hospitable staffs, good services, clean water, the meals are worth the prices, and above all, it is located in a very serene environment and their rooms are nice and very spacious. I had a really good stay at the hotel. I was well received by the staff of the hotel. The room I stayed in was okay; well cleaned and comfortable. Good facilities were available for use and necessary toiletries were provided as well. The food served was nicely and well made. The services rendered were generally okay and I would rate the hotel an eight over ten. I love Annes Luxury Suite, their services were amazing. Checking in was swift and I was allowed into the room early. The hotel's management and staff were experienced in hospitality, their facilities are very standard and functioning. The room was beautiful and the air conditioning unit functioned very well. I was satisfied with my stay at the hotel. My stay at the hotel was okay. It was just basic, nothing spectacular. The room was just okay. The services rendered was just as expected. I would rate the hotel averagely. Have nice pictures of Annes Luxury Suite?